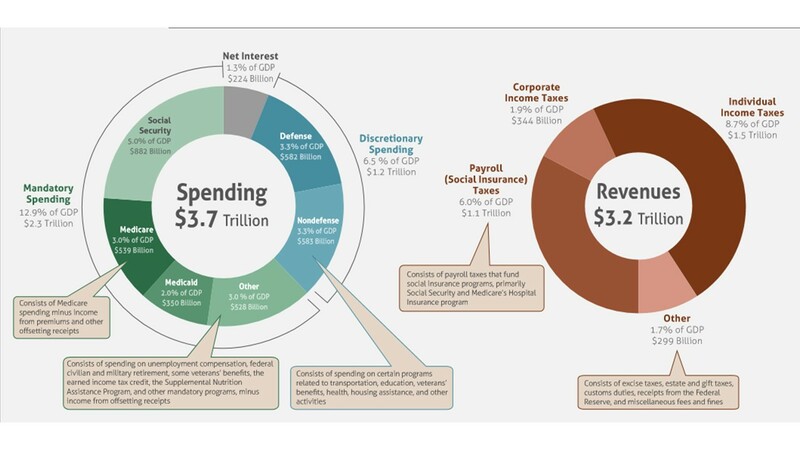 Editor’s Note: Social Security retirement benefits are a debt owed by the Federal government to retired workers – a detail CBO omits in their newly released budget graphics. Benefits are paid from incoming payroll tax dollars withheld for that purpose. Surplus payroll taxes create debt because they’re put into U.S. Treasury securities owned by the Social Security Trust Fund. The money is then spent elsewhere. The Congressional Budget Office has released infographics that show how much the federal government spent and took in during fiscal year 2015, as well as broader trends in the budget over the past few decades.